One of the biggest things an outdoor bride will worry about is the chance of rain on her big day. As much as we would like to, we can’t change the weather so I say embrace it!! Rain on your wedding day could mean a bountiful of different blessings so it may actually be a good thing!! Rain cleanses- everything usually looks fresh and clean after a little rain. It brings unity-a wet knot is harder to pull apart then a dry one therefore the creation of a stronger bond that is not easily broken. 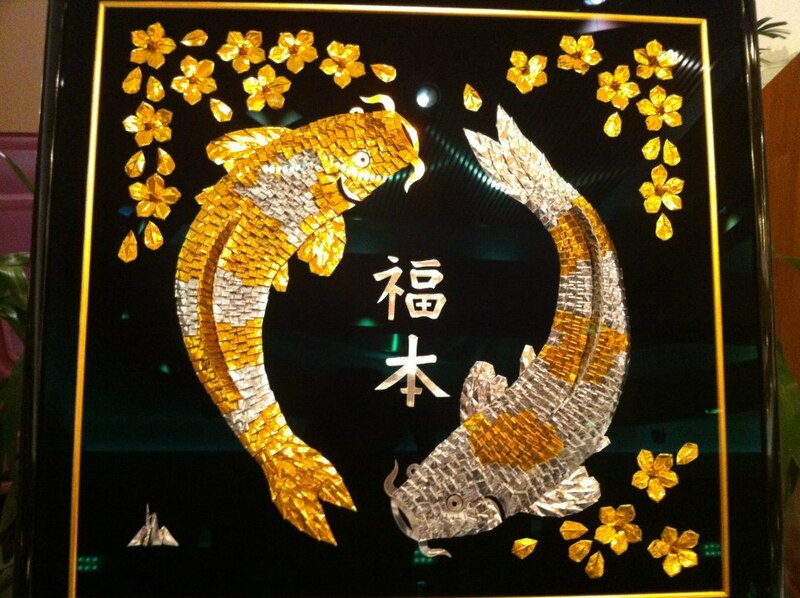 And Good Fortune-water makes things grow and brings the hopeful expectation of a new life. 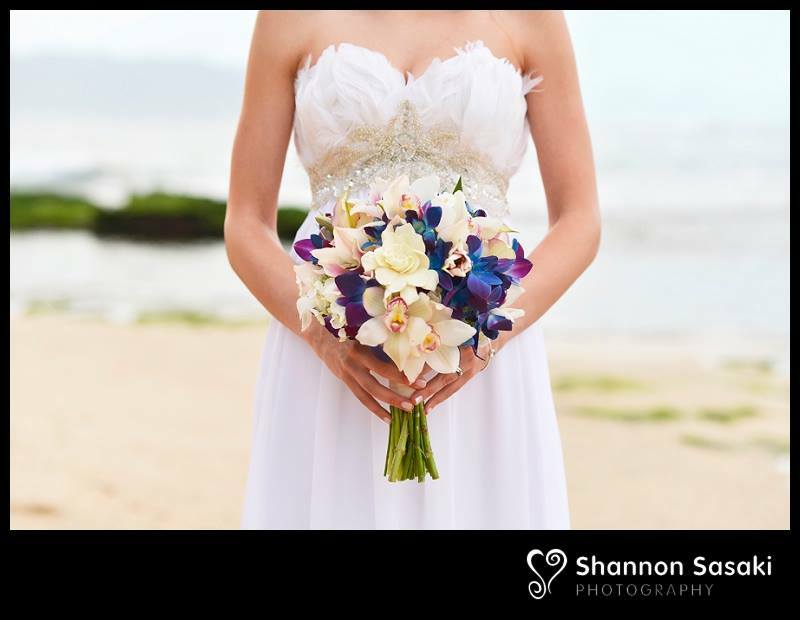 One of our biggest tips to our Hawaii brides is to always be prepared. Reserving a waterproof tent will keep everyone dry and happy regardless of the weather. You can also try double checking your venue to see if it’s there is a back up area that you can quickly relocate to if the weather doesn’t hold up. And of course, if you have a wedding planner, they should always have a rain back-up plan! Name Change Checklist – Hawaii Brides Pin this NOW! A lot changes happen after you get married, a partner for life, a new family, a new place to live etc. Through all these changes brides can often overlook the changing of their last name. Your name is your identity and it follows you everywhere you go so make sure you’re prepared and change all the necessary things! 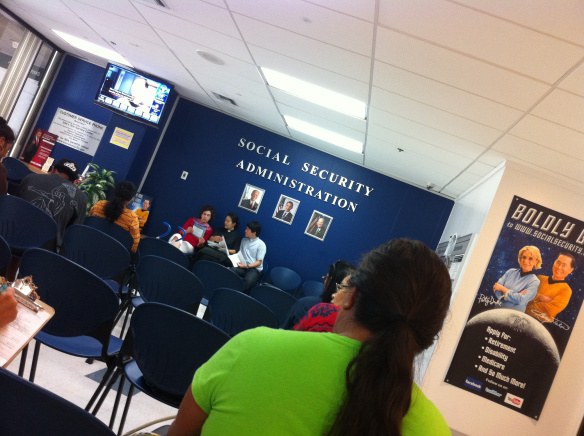 What else do you need to know and what steps do you take to start the name change process here in Hawaii? Lucky for you we’ve got it all laid out, in our most Popular blog post – How to change your name in Hawaii. Check it out today or PIN it now and check back later – it’s got every detail you need to know for brides changing their name here in Hawaii – including, where to go, who to call, where to park, etc. The complete insiders gude to changing your maiden name to your married name. Bridal Barefoot Sandals, Perfect for Hawaii Beach Weddings! Browsing on Pinterest I came across another unique style tip for our Hawaii brides! I am excited to share with you the Bridal Barefoot Sandal! Perfect for all of our Hawaii Destination Weddings & ceremonies on the sand! Just the right amount of elegance with all the comfort and simplicity! The Bridal Barefoot Sandal comes in a variety of styles from simple pieces with small pearls to extravagant ones adorned with large gems and lace. I consider these beautiful pieces to be more like jewelry than footwear! The last thing our beach brides want to worry about is walking down the aisle and losing a shoe in the sand! The Hawaii Bridal Beach Sandal is the perfect accessory to top off any beach bridal look. It has the elegance our brides love with a level of practicality that’s appropriate for an outdoor setting. Typically, one lucky lady catches the bridal bouquet in hopes of being the next one to walk down the aisle. Why not spread the excitement to a few more of your female guests by having a breakaway bouquet. The breakaway bouquet is comprised of smaller bouquets that separate when thrown into the air. This is especially great for large wedding parties. Talk to your florist about this, I’m sure he or she can assist with creating the perfect “Breakaway Bouquet” for your special day. If you’re having an outdoor wedding and don’t want your guests diving into the dirt to catch your bouquet try opting for a dedication. Perhaps there is a special someone you would like to dedicate your bouquet to – your mother, grandmother or maid of honor? Presenting your bouquet to any one of these special ladies would be a beautiful and sweet gesture. Consider also adding a personalized note to the bouquet with a photo of the two of you telling your grandma (mom or maid of honor) just how much she means to you:) Love this idea! Why not use your bouquet as a way to honor previous marriages that have stood the test of time. Have all married couples come out to the dance floor. While they dance, have the DJ or emcee announce who has been married 1 year, 5 years, 10 years etc. to sit down as your favorite love songs play in the background. Keep the game going until just one couple is left standing. Present your bouquet to the couple that is married the longest. This is a beautiful way to celebrate the longevity of marriage. Whether you decide to do the traditional bouquet toss or do something a little different for your Hawaii Wedding – Or maybe you’d like to order an extra bouquet and do both?! Remember that it’s your big day and whatever you would like to do with your bouquet is up to you. The truer you are to your own desires, the more meaningful your special day will be! Hope you had a fabulous Thanksgiving Feast! GoPRO >> The Secret to Capturing your Hawaii Wedding’s Best Moments! We recently came across a fabulous idea on YouTube – The Secret GoPro Wedding Camera. For those of you who don’t know, a GoPro camera is a tiny little camera that shoots amazing wide angle footage in HD. They can cost somewhere between the $200-$300 range and can be a great investment for any adventurous couple. The GoPro camera is used mainly for outdoor activities such as surfing, snowboarding, skydiving, etc. because of it’s ability to capture such amazing footage. But… we have found they can also be perfect at capturing weddings. This clever couple hid a GoPro camera into the bridal bouquet and caught some amazing footage of the entire wedding day. I’m pretty surprised my husband hadn’t thought of that for our wedding (since he is GoPro obsessed) … I just showed him the video and he was like “dammit! We should have done that!”. Exactly what I was thinking! It’s a pretty awesome idea and could be edited into a really fun video later. You’ll be able to capture the entire day and probably some of the **sweetest moments, straight from your perspective. I’m sure the “I do” moment is killer from this angle too! So yes, I thought I just had to share this wonderful idea with you, all of our favorite bride & grooms (and vendors!) so that all you brides to be can take advantage of this super easy, really fun, and extremely inexpensive way to capture all of your special days most intimate moments. Happy Tuesday ! Cheers to a short week & an amazing Thanksgiving weekend! Loving this super cute idea I found on Minimozblog, thought you’d LOVE it too, I just had to share!! This framed piece of art consists of hearts cut out of maps and centered around significant locations; each heart representing a milestone. Maybe you met in California, married in H A W A I I and will reside in … New York? Whatever your story may be, this is a beautiful and unique keepsake that can summarizes your special journey together. I love how this can be completely unique to each couple! It’s especially cool for those who’ve had a destination wedding or love to travel. And we know there’s plenty of you around the world brides this year! You can even expand it as your relationship grows and map out your trips, favorite places, family etc. It’s a great way to see where you’ve been, what you’ve done and maybe even where you’ll go. 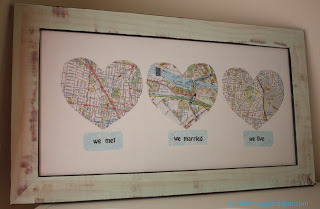 It’s a really easy and fun project that would make a great wedding gift for your husband to be! Or a great “first christmas gift”. The possibilities are endless! If you’re a Hawaii Bride, or of Japanese heritage, you have probably heard of the Japanese 1000 crane wedding tradition. But if not… here’s a quick background: The 1000 crane tradition started as a folklore that said “if a bride finishes the laborious task of folding 1000 paper cranes also known as “sembazuru” she would be greatly rewarded with a happy and prosperous marriage”. The folding of the cranes is very popular here in Hawaii and over the past few years we always get tons of questions from brides wondering how to best display all of their hard work. We have found that most brides choose to frame the 1000 cranes, as this is a way to display the cranes and keep them as a piece of art and keepsake that will last generations (scroll down to see a pic). However, many of you brides might be leaning towards displaying them in other ways – like hanging them as an elegant art installment to be featured at your wedding. Well, if this is the case, we have a few FUN ideas on how to hang your cranes in a beautiful and elegant way that will create a wonderful display at your Hawaii Wedding. How to Display 1000 Cranes: Oragami Crane Garland! Why not display your cranes as a backdrop to your wedding cake? String them along (see instructional below on how to create Oragami Crane Garland). and then hang from ceiling (or tent) in several long lines, creating a backdrop to your wedding cake. A gorgeous way to highlight your cake and a beautiful backdrop to the cake-cutting ceremony. Tip: Make sure to secure the foot of each string of cranes to the ground with some sort of weight to ensure that they don’t blow around or move out of place. Same idea as the backdrop for the wedding cake, but this time use them as a backdrop to the head table or sweetheart table. String them along (see instructional below). and then hang from ceiling (or tent) in several long lines, creating a backdrop to the main event… You! Several long strings of cranes will create a magical backdrop and will also look amazing in photos. Tip: Make sure to shine some sort of uplighting on the cranes so that they don’t fade away into the background once it gets dark! IDEA 3. Hang your 1000 Cranes on Clothespins, Perfect for a ShabbyChic or Rustic Wedding! Hang your cranes with multi-colored clothespins. This is perfect for a rustic or shabby chic wedding! You may even decide to just use shades of the same colors used in your wedding color scheme. Or perhaps an array of ombre colors?! Spray paint clothespins ahead of time to ensure they are dry. Tip: Choose the hanging spot for the clothesline ahead of time and make sure to measure everything out to ensure that the space can fit 1000 cranes. IDEA 5. 1000 Cranes: A Backdrop to your Ceremony! Same idea as the backdrop for the wedding cake or sweetheart table, but this time use crane garland as a backdrop to the ceremony area. Hang the strands from the wedding ceremony tree, or from an arch piece creating a gorgeous backdrop to the main event… you and your fiance’e saying “I do!” Several long strings of cranes will create a magical space and will also look amazing in those first kiss photos. Tip: Make sure the bottom of the strands are secured down properly, you don’t want them blowing around in the wind and getting all tangled up! And of course… if the idea of hanging the cranes, sounds like too much work for you, you can always get them framed. 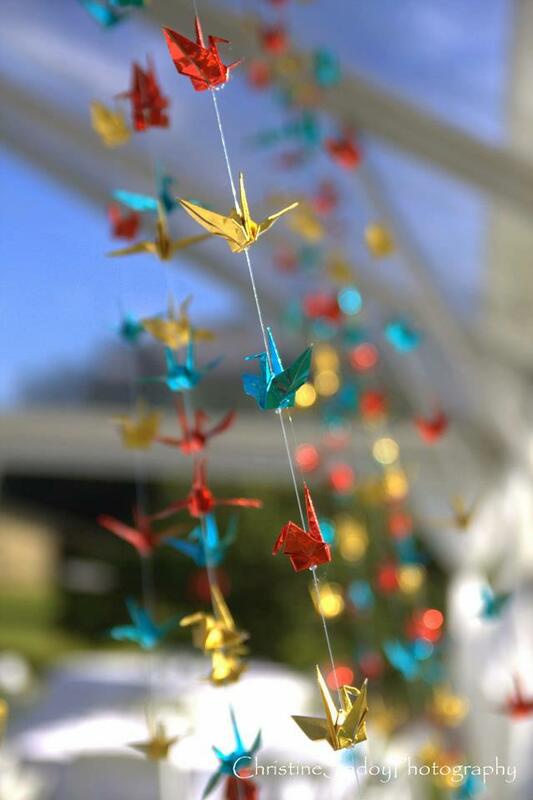 Here’s a fabulous display of framed cranes that was used at one of our previous weddings. Bride Andrea & groom Brian did an amazing job with this 1000 Crane display. I wanted to create this blog post to give a few ideas to one of our very special brides.. Layna, but hopefully this inspires you as well. Any additional ideas or thoughts on how to hang 1000 cranes? We’d love to hear them… Do share! We had gotten to know Neal + Kristen pretty well over the past few months and have grown to feel quite close to them. If I had to describe the two of them, I’d have to say in a nutshell, “They are completely perfect for each other in every way from the way they are always holding hands, to the way they call each other “honey”, to the way they just look at each other and you know – these two are ment to be.” Erika, Kelli + I truely felt honored to be a part of Kristen + Neal’s very special day. Even with the Tsunami, this wedding felt perfect, in every way! 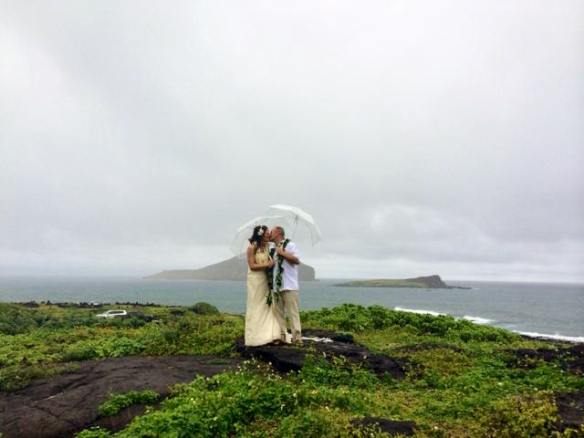 We just wanted to share a few pics from their special day with all of you… But before the pictures.. A Big MAHALO to everyone who helped make Neal + Kristen’s day such a Success! Especially to Geri, the director of events at the Ihilani, Mariott hotel, Ko’olina. It was a joy to work with you, thank you so much for all of your help:). To the entire catering and wait staff at Ko’olina, for executing a flawless event and for notifying us of the early tsunami warning. We can’t thank you enough for all of your help ensuring that Neal + Kristen got to enjoy their “Best Day Ever” even under the unforeseen circumstances. To all of the staff at the Ihilani Spa ~ did an amazing job with the bridal parties hair and make-up! All the girls looked so beautiful! Especially bride ~ Kristen! To Raymond Donato ~ as always, you are amazing! It was the first ceremony we have seen Raymond perform, but he was awesome. Which of course we totally expected. You are one of our favorite people, and we can’t wait to work with you again soon! To The Patisserie and Kristie, for a gorgeous and delicious cake! The cherry blossom design looked amazing under the purple light & with the glowing cake topper Kristen bought! To Jill and the wonderful team at Easley Designs for the beautiful flower arrangements at the ceremony and reception! Additionally, your two large vase designs also made about 20 seniors extra happy the following week (with our Hawaii Wedding senior care home flower donation program – Share the Aloha), so thank you for that as well! 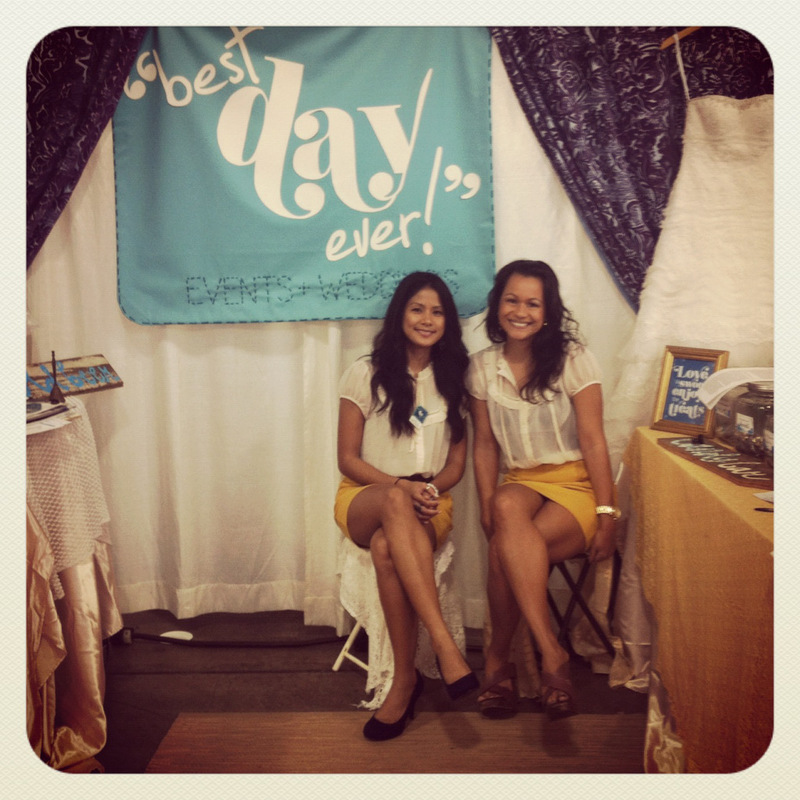 Specialty linen, chair covers, sashes, pipe and drapes were done by It’s So Pretty Linens & Decor. Jazz, you were so easy to work with, and you did a fabulous job on the set up! The ballroom looked gorgeous! Also to deejay Wilson at Audio Zone who totally set the mood for the entire night handling all of the music, deejaying, adding fun uplighting with a monogram and assisting with the slideshow. As always ~ it was a joy to work with you !! To all of Kristen + Neal’s friends & family… Especially to the bridal party ~ Kathy, Charity, Sheenae, Neal, Branden & Matt and ring bearer Daniel… It was a pleasure meeting all of you! Thank you for all of your help in creating Neal + Kristen’s “Best Day Ever!”. Also a Big Thanks to Shirfeir & Fred, who helped with the sign in table. You guys were the best! Thank you for all your help making sure all the guests got signed in so quickly. To Neal + Kristen’s parents & grandparents… it was a pleasure meeting all of you as well. Sending you a Big Congratulations too! And of course, to Yamato, the emcee. You did an amazing job! Being an emcee is no easy task, especially when it is assigned to you at the last minute, and you managed it effortlessly! Last but not least… A big Thank YOU to the bride and groom ~ and a huge Congratulations to Mr. & Mrs. Kristen + Neal Jensen! Thank you for making our jobs so wonderful! Not even a Tsunami could stop this amazing couple from having their “Best Day Ever!” It was a joy to get to know you both, and an honor to help you with your wedding! Thank you for trusting us with your special day! What a beautiful couple! Congrats Neal + Kristen! Lovely ring shots by Juan! A few shots of the girls getting ready in the new bridal suite at the Ihilani hotel. Erika, Kelli and I getting the reception and ceremony area prepped for the guests and going over timeline details with Yamato, the emcee. Red and Blue (the bride and grooms favorite colors) ended up coming together quite nicely to create a big impression for guests. Amazing job with the linens, chair covers, sashes & pipe and draping done by Jazz and It’s So Pretty Linens. The bridal party waiting for the bride to walk down the isle… Lovely flower arrangements & designs by Jill and the Easley Design team. Love these shots of Kristen and her dad… the expression on his face is priceless! Raymond was a wonderful officiant and led Neal and Kristen through a very heartfelt and sentimental ceremony. It wasn’t until they read their personal vows to each other though that I found myself tearing up! Bridal party & family shots… everyone looks so happy! ” Congratulations to Mr. & Mrs. Neal Jensen! “ Cheers to your “Best Day Ever”! And on to the reception! Unfortunately because of the uplighting my camera didn’t capture too many indoor shots very well… but trust me, from the lobster tails to the samurai sword cutting of the cake to the Tsunami warning and seeing the majority of the crowd having too much fun to want to head home dancing to “Gangnam Style” begging DJ Wilson for one more song, … this was day to remember! Also, Neal and Kristen generously donated two 7 ft. arrangements to our Share the Aloha – Senior Care Home / Wedding Flower Donation Program… so I spent about 3 hours rearranging the florals into smaller arrangements for a few lucky seniors at Pearl City Nursing home, Island Nursing Home and Hale Nohea. Deliveries were made promptly the next few days so that the flowers stayed fresh. 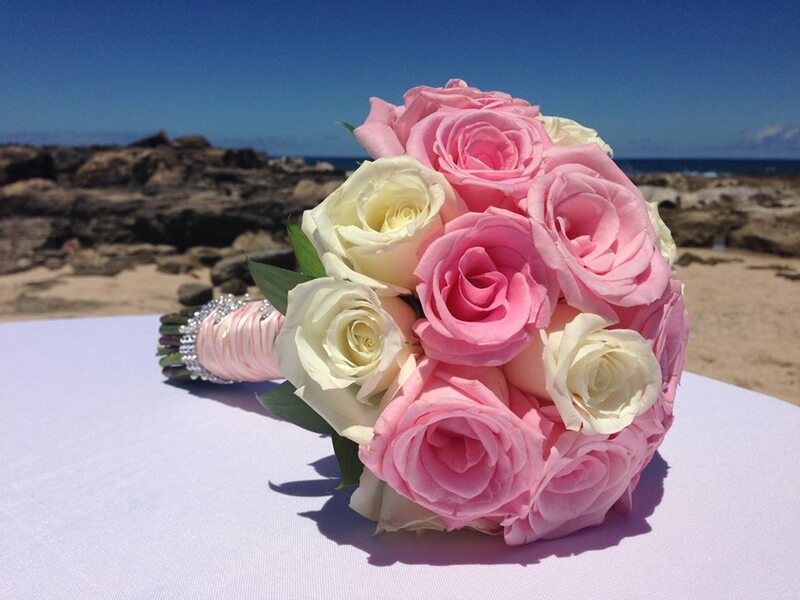 If you have wedding flowers you would like to donate, please send us an email – dropaline@bestdayeverhawaii.com. We will handle all of the upkeep, pick up and drop off – and of course, it’s free! For more info. click here. Congratulations Neal + Kristen! We hope you had a magical honeymoon in New Zealand and can’t wait to see photos! We wish you the best in your new life as Mr. & Mrs. Neal Jensen! How I came across Madeleine Shells ~ the perfect beachy themed wedding favor… After a long day I was craving something simple and sweet. I thought a cookie would be just the thing!! I dropped by a small local bakery and came across madeleines, french butter cookies. Looking at the freshly baked cookies I was instantly reminded of sea shells! (Madeleines are traditionally baked in scalloped edged pans) These golden brown cookies became my newest inspiration for a beach themed wedding favor! You can find madeleines pre-made in specialty bakeries or you can try making your own using this highly recommended recipe from 101 cookbooks. 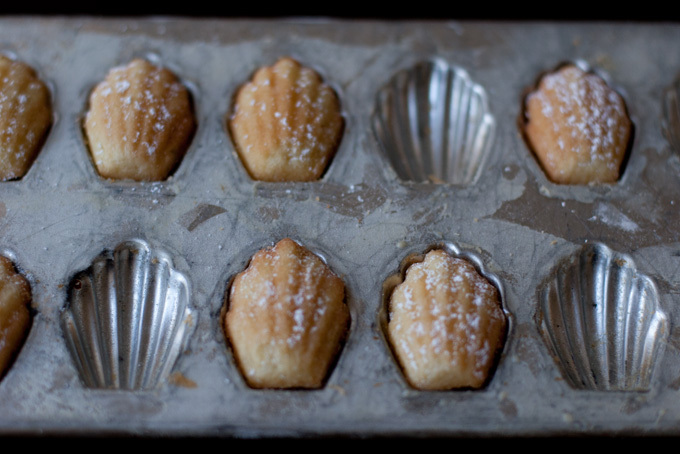 Place one or two madeleines into a clear cellophane bag, tie a blue or beige ribbon and add a seashell shaped tag. Wanna get fancy? What about placing the cookie in a small bag and then putting that smaller bag into a larger bag filled with a little bit of sand and shells and even some sea glass, then tying off with a nice ribbom? These cookies are elegant enough for a formal wedding and are beautiful enough to display without embellishments. Delicious and simple, magic words for any busy bride! They also go great with last weeks Sea Glass favors! Why not mix them up? Happy Tuesday everyone! Hope you had a fabulous long weekend!! Growing up on the beautiful island of O’ahu in Hawaii, of my favorite pastimes was hanging out at the beach and going treasure hunting … and I’m not talking about searching for pirate treasure. I used to love hunting for unique sea shells and pretty shards of sea glass. I even had a few friends who would spend hours hunting down the perfect pieces and turn them into fun art projects. Now here’s the fun part – For all you crafty DIY Hawaii Brides, here are a few fun ways to incorporate these beauties into wedding favors for a Hawaii beach themed wedding! This will be a two part blog so stayed turned for part two next week! 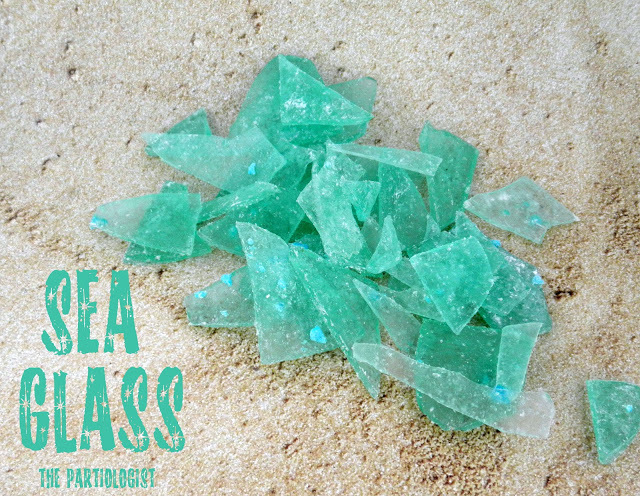 Edible Sea Glass Hawaii Wedding Favors ~ LOVE!! How to create Edible Sea Glass Wedding Favors – in 6 easy steps! 1.Boil 2 cups of sugar, ½ cup of water and 2/3 club of white corn syrup together until you reach the “hard crack” stage (300 degrees F) and add your choice of flavoring or food coloring. 2. Pour mixture into a cookie sheet (aka. jelly roll pan) greased with a cooking spray. 3. Allow to cool and break into pieces using a knife. 4. Lightly sprinkle the candy shards with powdered sugar and toss to prevent sticking. 5. Take a small clear plastic bag add 1 Tbl sp. Of raw sugar and a little white chocolate sea shell to each bag then add the edible candy. 6. Finish each bag off by tying a ribbon or piece of tulle. Customize the flavor and color according to your personal preference. Like all of our favorite and ultra unique hawaii brides, each piece of candy is one of a kind. Love that! Pretty cool right? ~ And the best part… It’s very inexpensive & oh-so-easy! Hope you enjoyed part 1 of our DIY Monday Post!